You got the blues, brother? You better check this out! These guys are on a mission from God, and you need to get in on the act! This gorgeous 8-inch by 10-inch framed work of art includes a stunning print and 4 terrific hand-selected film cells. 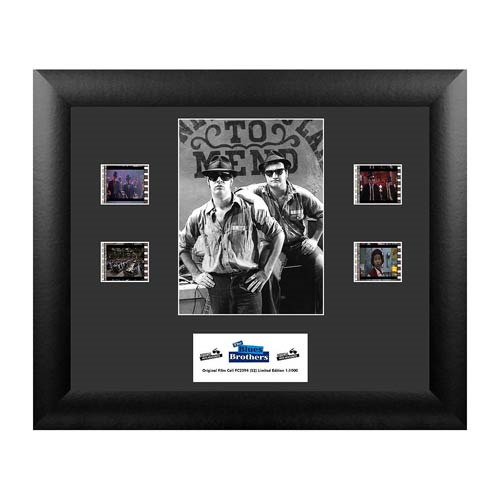 Each Blues Brothers collection is unique and quite literally, one-of-a-kind. Looks great in home or office. Get yours while the gettin' is good! In The Blues Brothers, Jake (John Belushi), fresh out of Joliet prison, and his brother, Elwood (Dan Aykroyd), are on "a mission from God." Their crusade? Reunite their old band and perform a benefit concert in order to save the orphanage where they grew up. Along the way, the destructive, fun-loving brothers are chased across Illinois by cops, Nazis, and even Jake's armed ex-girlfriend (Carrie Fisher). This musical comedy is based on Belushi and Aykroyd's characters on Saturday Night Live. The cast includes a host of celebrities, including Ray Charles, Aretha Franklin, James Brown, and Cab Calloway... all of whom act, perform musical numbers, and sing on the soundtrack.